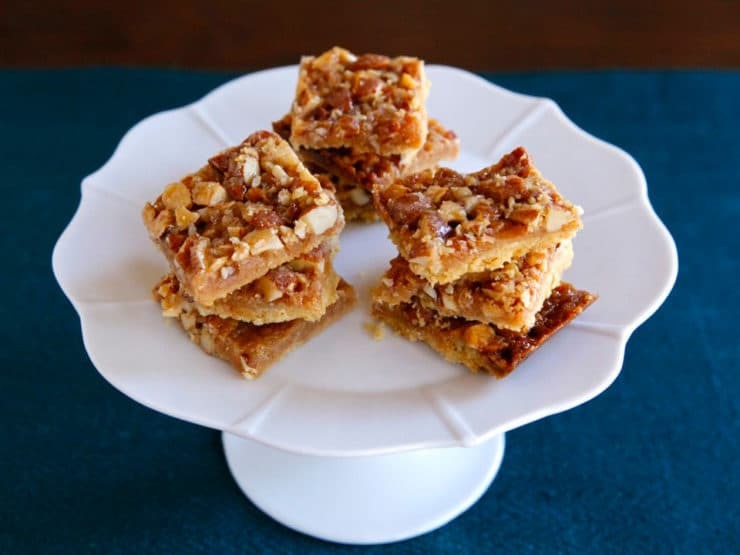 Bienenstich Bars – The Monday Morning Cooking Club shares a recipe for sweet Bienenstich Bars inspired by Lena Goldstein, a survivor of the Warsaw Ghetto. 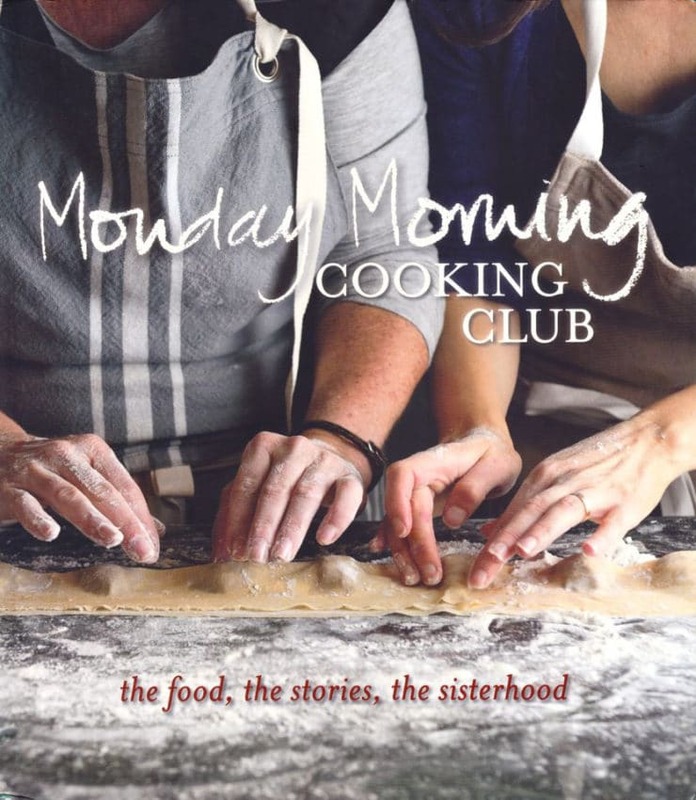 Last week, I received an advance copy of a cookbook called the Monday Morning Cooking Club. I’m often sent books by publishers in hopes of a mention/blurb on the site, though lately I haven’t had as much time to cover cookbooks as I’d like. I was about to add this book to my (very large) “to do” pile when something told me to flip through it. I vaguely remembered the story, conveyed in an email or website comment a few years back, about a group of Jewish women in Sydney, Australia. In 2006 they started a group, which they named the Monday Morning Cooking Club. Inspired by the strong connection between food and the Jewish people, their goal was to create a collection of recipes to represent the diversity of Jewish culture. Over the course of several months calls were made, emails were sent, and eventually a list of cooks was developed. These cooks were asked to contribute recipes for the dishes they were best known for – the ones that had been passed down through the generations by family and friends. The group began their Monday morning meetings in Lisa Goldberg’s kitchen. They shared cups of tea, cooked together and discussed which recipes deserved to be in the pages of their book. After three years of testing, the chosen recipes were compiled and published in a book in Australia. An American version of the book is being released on September 17. As I looked at the recipes, I realized that the book was something special and worthy of sharing with you all. Each recipe includes a brief family history– where the recipe came from, how it evolved within the family, etc.– which makes it a fun (and often touching) read. A business card was attached to the book from Lisa Goldberg, asking to meet with me when she comes to Los Angeles in September. Sadly, I’ll be out of town shooting a new sci fi TV series that I co-wrote (yes, at the moment I write recipes and sci fi, which has proved to be quite a balancing act!). Since I won’t be able to meet with Lisa, I figured the least I could do was share one of the lovely recipes from Monday Morning Cooking Club with you all. 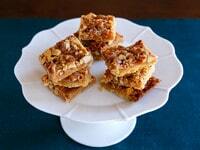 This Bienenstich recipe that appears in the book comes from Lena Goldstein, whose family grew up in Poland. Lena spent the majority of WWII in the Warsaw Ghetto before escaping to a hidden, overcrowded bunker. When the war ended, she believed she was the only member of her family left. While working for the Jewish Committee, a group that worked to reunite families, she received word that her sister and brother-in-law had also survived. Lena married in Poland and relocated to Australia with her husband in 1949. The recipe was given to her by a German friend who had moved to Sydney before the war, and it has since become a family favorite. In German, bienenstich translates to “bee sting” (because of the honey used in the topping). More often bienenstich refers to a layered cake with caramelized almonds and vanilla custard. Here, the same concept is applied to simple dessert bars with the cream layer omitted. I thought it would be an appropriate recipe to share for Rosh Hashanah, given the honey element. It turned out delightful– crunchy, chewy, rich and caramelized. One thing to note– this book, being Australian, has metric measurements. While some ingredients offer converted American ratios within the recipe, others do not, which means you’ll need to use the conversion index at the end of the book (or some simple math) to help you convert certain things. Of course, I’ve already converted this recipe for you. Overall I’d say it’s worth the extra effort, as the recipes are truly special. All proceeds from the sale of this cookbook benefit charity, making this a very worthwhile project. 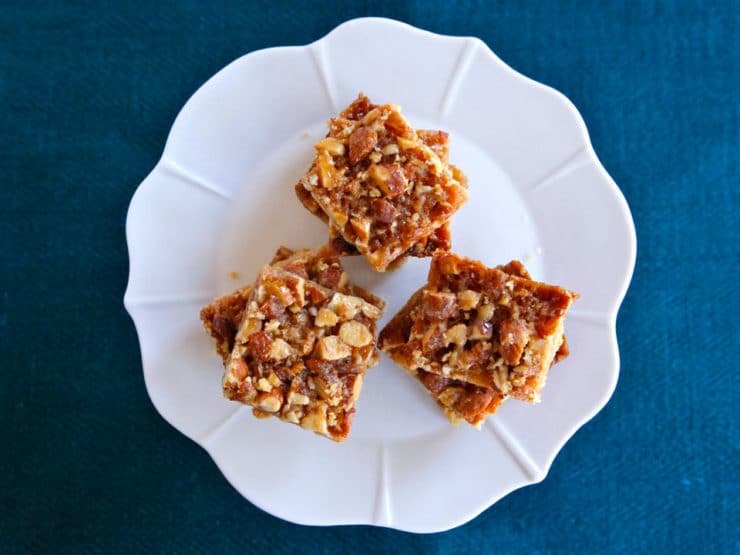 The Monday Morning Cooking Club shares a recipe for sweet Bienenstich Bars inspired by Lena Goldstein, a survivor of the Warsaw Ghetto. Preheat oven to 350 degrees. 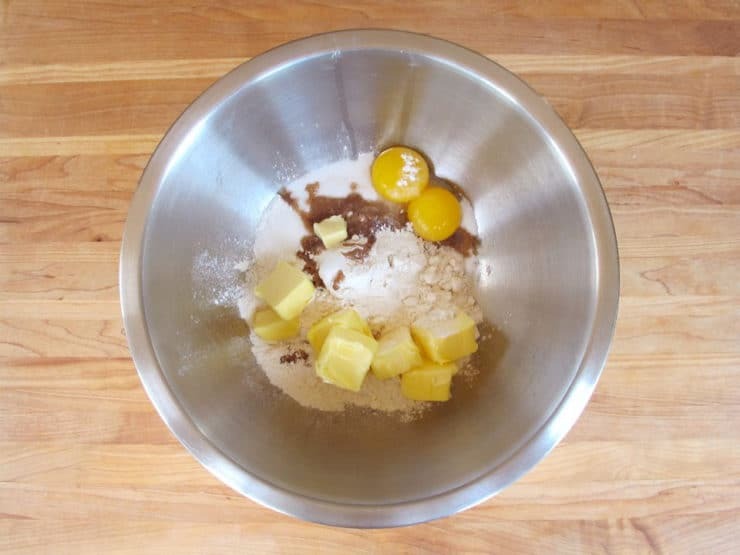 To make crust, combine butter, egg yolks, flours, sugar and vanilla in a large mixing bowl. 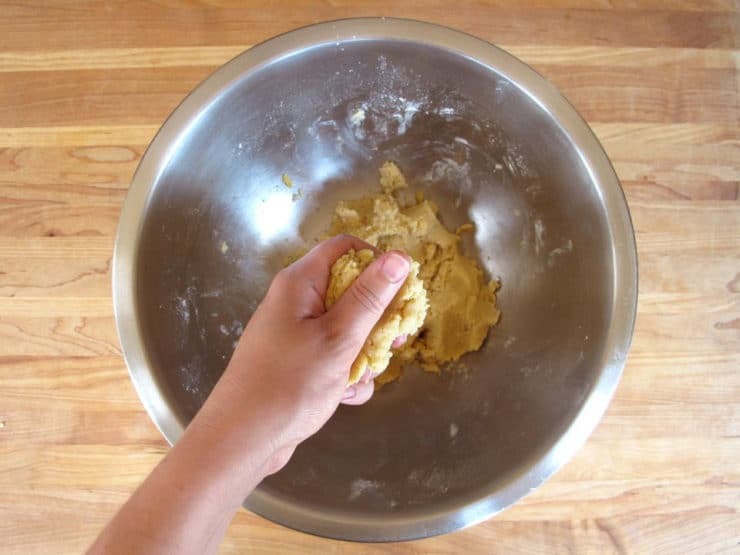 Mix and squeeze mixture together with your hands until a smooth dough is formed. Evenly spread the mixture into the bottom of a greased, 9x13 baking pan. Set aside. 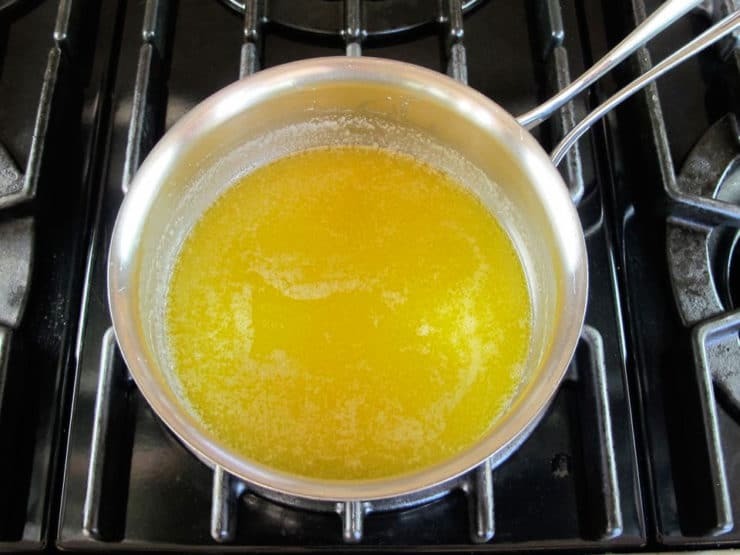 To make the topping, melt the butter, sugar and honey in a saucepan. 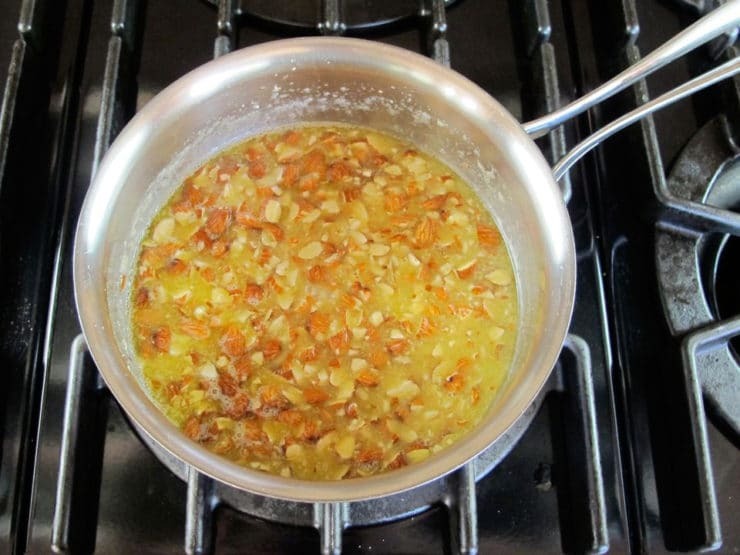 Once melted, add the chopped almonds and stir to combine. Pour topping mixture over the crust and spread evenly. Bake for 40-45 minutes. 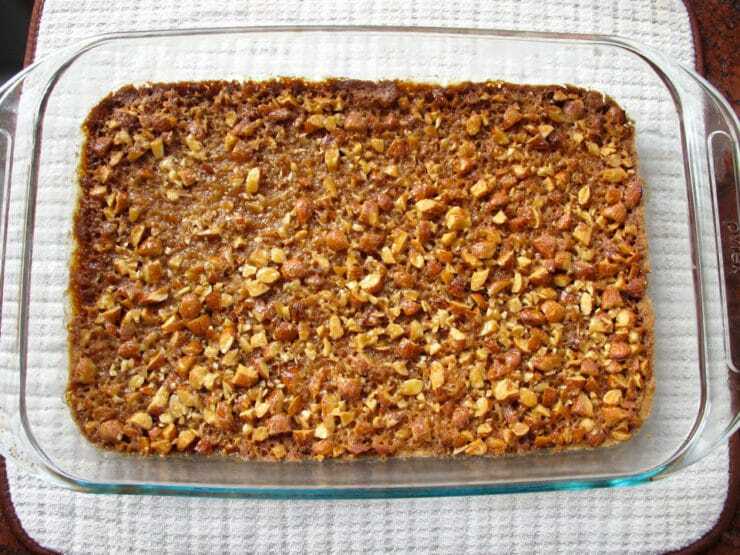 Allow to cool completely in the baking dish before slicing with a sharp knife. 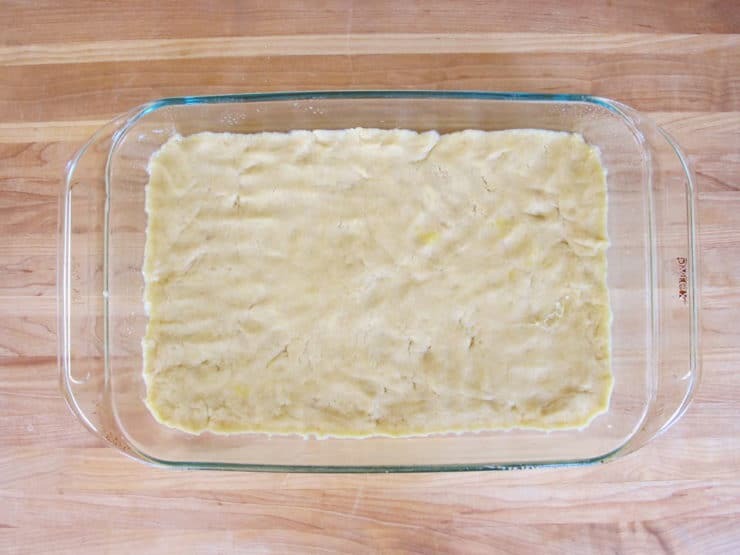 Use a thin spatula to carefully pop the squares out of the baking dish. I found this recipe when looking for a new treat for our annual Hanukkah party. They were the hit of the party. I made a few changes on how I prepared. I did the dough in my food processor, then I rolled it between two pieces of parchment paper. My first batch was too dark around the edges, so I started checking at 30 minutes. I also made a batch with pecans. This is so easy and as I said it was the night’s winning treat. I truly enjoy you web site, it is my go to for Jewish recipes. I made this recipe for Rosh Hashanah. I didn’t have self-rising flour, so I used the adjustment with baking powder. It baked and sliced well, but when I took it out of the pan, the crust just crumbled, so that we ended up just eating the top part (which was delicious). I saw that you said that it was not really your recipe, but do you have any suggestions for me? Thanks, Tori and I wish you and your family L’Shanah Tovah! to try these. Is the baking pan 9 x 13 inches or centimetres? I’ve made several of your recipes to rave reviews. This one has me flummoxed. I’ve made it twice and it just won’t cut nicely eventhough I let it cool overnight. It’s true that I didn’t use self rising flour but substituted the baking powder adjustment instead. Could that make such a big difference? the flavor is terrific but it came out more like topping for ice cream. HELP! Hi Helene! Technically this is not my recipe, I have only made it once– it is from the cookbook referenced in the blog, so I’m not super familiar with it. I had good luck with it when I made it, and it did slice well for me, though the edges and crust tended to crumble a bit. I’m so sorry, I wish I could help you more! I found out from another food writer that I follow on facebook, she is having trouble getting them to take her content off. There are so many links of yours.. thought you should know. Thanks Barbara, yes we are in the process of filing DMCA’s for each post. I appreciate the heads up! This recipe looks great and references my family name. Most people think I am French but I am Jewish of Polish- Russian descent. I am inspired to create an illustration based on recipe and share it to my relatives!! Do you have any recipes for flaky Israeli style halvah? I tried one recipe this week and had an “epic fail” that tasted great but was the texture of sticky toffee, w/o ANY flakes. 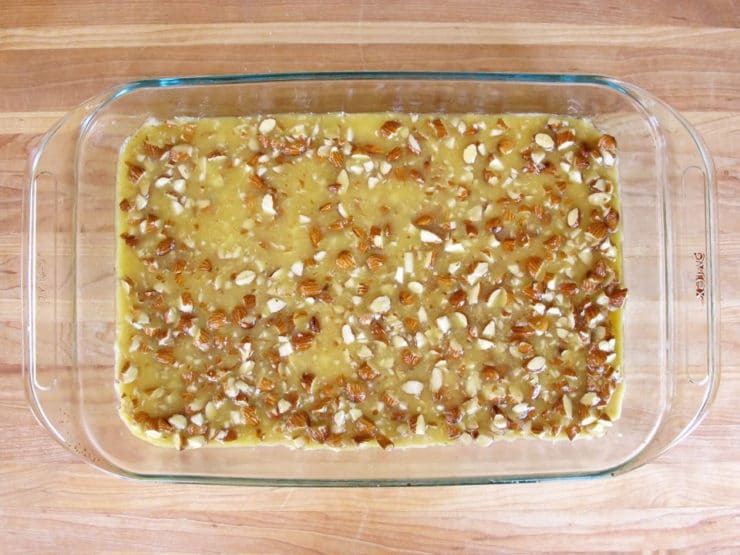 These bars look like the perfect combination of almonds with butter and sugar. Can’t wait to try them. I must ask you….I saw a picture of your “Sukkot Tablescape” on Kveller and noticed that you used what appears to be the varicolored Rose goblets sold at the Madonna Inn in San Luis Obispo-I’ve collected these for 20+years! Great minds think alike(I guess)! Help~!!!! I made these yesterday to bring to Book Club last night~! Followed exactly. After 35 mins. they were so overdone around the edges. Took them out, cooled them, cut them and they seemed almost underdone in the middle. The crust was leaking butter~! BUT, the gals loved them and want the receipe. Before I give it, do you have any help you can give~?? Thanx so very much~! Luvvv your blog~!! So sorry to hear that Mickie! I’ve only made these once because it’s not a recipe I personally developed, but I didn’t have this issue. I wonder if maybe your oven runs a little hotter than normal, which can sometimes lead to things getting overdone on the outside without being cooked all the way through. Next time put it in the center of your oven, lower the temp by 25 degrees, and start checking them around 30 minutes. They will take longer to cook through than 35 minutes due to the lower temp, but start checking at 30, and if you see them becoming overdone around the edges, put a layer of foil on top to protect the top/edges and let them continue baking till they are cooked all the way through. Hope that helps! Thank you for the metric measurements. I am slowly converting all my recipes to metric. It is just so much more accurate and consistent. Hag Sameach. Thank you Tori. If I don’t talk to you before, have an easy fast. How many bars does this recipe make? Shame you converted the metric back. Shouldn’t America catch up with the rest of the world? Is there a Yiddish name instead of German? If you enjoy cookbooks w/stories, please consider “Recipes Remembered” . It is a cookbook w/recipes from Holocaust survivors and they tell their stories for each recipe about their experience in the Holocaust. I purchased this from Qvc and stayed up all evening reading the stories. It is a wonderful cookbook that you will enjoy! A friend of mine visited Australia and bought this wonderful book for me as a gift. As I too am from South Africa, I could relate especially to this book but it will be enjoyed by all who love God Jewish foods. I would highly recommend it if you can get hold of it. Hi Tori, Mine are in the oven as we speak! SO easy!!! Definitely not for dieters, but perfect to take to parties! Thanks for all of the yummy recipes you share! I’ve made so many already, and because they’re always so much enjoyed, I’ve shared your blog with lots of friends and family! Thank you, thank you! Shana Tova! I made this recipe yesterday. I had all the ingredients on hand except for self-rising flour. So I used the DIY Smitten Kitchen version you had mentioned in the comments. 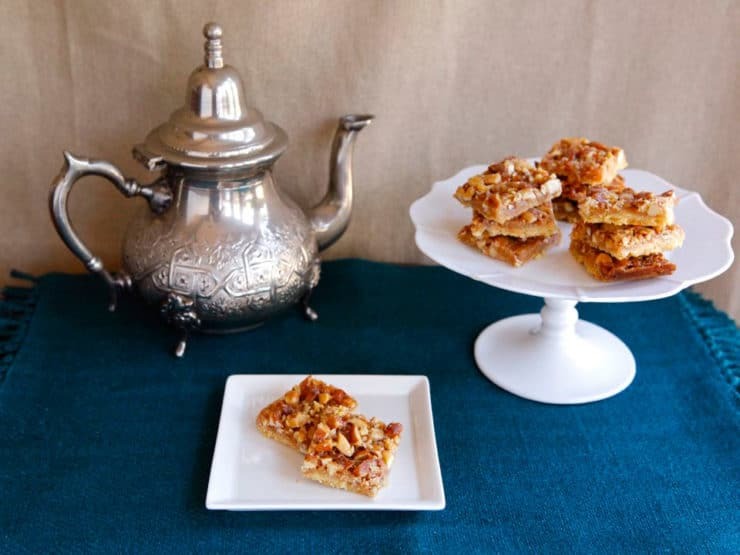 This recipe is extremely easy to make and the bars are truly delicious. I won’t make these too often because they’re hard for me to resist but I’ll definitely make these for special occasions and/or company. Thanks, Tori, for another great recipe and interesting story. MMMM I wish there was a GF alternative, and a non dairy alternative. I’m wondering about oatmeal flour for the crust ….. Thank you so much for recommending this book. I don’t know why I find Jewish cuisine so fascinating but I do, and it’s such a niche here in Australia. You’ll really enjoy it Mitchell! BARS LOOK YUMMY. CAN’T WAIT TO TRY THEM……. Koestlich, Bienenstich!! Muss ich auch bald mal wieder backen. Ach! I am plotzing, my grandmother used to make this. Thank you so much for taking the time to share this book and recipe with us, Tori. As a cookbook collector for a very long time, I find the recipe books garnished with stories and personal experiences to be the best ones to cuddle up with and enjoy. I’ll be watching out for this one. 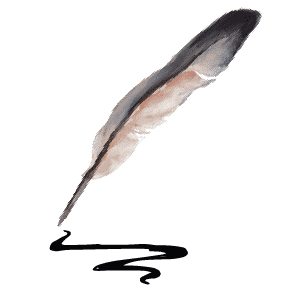 I give you a lot of credit for the amount of research and effort you put into your blog. I always enjoy stopping by to visit. I’m somewhat amused at your two “adventures” however, I’m confident you can somehow manage all the hats you wear! I’m a German shiksa, living in America now, avid follower of your blog, and I couldn’t help but to get excited when I saw your Bienenstich recipe. It’s my absolute favorite treat from back home! I’m wondering though, if the recipe is already dairy (using butter) why omit the beautiful vanilla cream layer? My grandma used to mix honey and equal parts of whipped cream and vanilla pudding, of which the latter can be made from a gelatine alternative like agar. For me, the cream is what makes this cake perfect and so refreshing on a hot summer’s day, right out of the fridge, as it was usually served in my childhood home. I’d definitely recommend trying it this way as well! Isabel – can you share the recipe you have that uses the vanilla cream layer? I think that would be a great addition and would like to try that out this week! Thank you! I think Isabel’s recipe is the Bienenstich cake. I found a recipe here: http://www.askchefdennis.com/2012/11/bee-sting-cake-by-a-feast-for-the-eyes/ It looks delicious – I’m a sucker for anything for anything with custard – but a lot more work than the bars. Hi Dori– I used raw, but I think roasted would also work if you prefer that flavor. I kind of liked the texture of the skin-on almonds (plus I think it looks prettier), but slivered would probably work too. The chopping doesn’t really take very long. Enjoy! ok, but what is “self-rising flour”? Is that like pastry flour? I only have AP flour. Can you share some of your favorite rose hashanah recipes you´d serve for lunch? ?